Whose periodic table is it anyway? This year we will be celebrating Dmitri Mendeleev’s discovery of the periodic table, 150 years ago. Or will we? There’s a discussion to be had about whether it was discovery or invention, but that’s not what I mean. It might be more accurate to say we are celebrating the fact that Mendeleev first wrote down an early draft of the table in 1869. 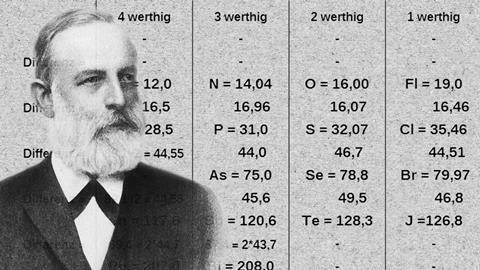 But that’s not quite right either, because the German chemist Julius Lothar Meyer wrote down a very similar periodic system of elements a year earlier, with all the familiar groupings: the halogens, alkali metals, chalcogens and so on. It’s just that he didn’t publish it, and it didn’t come to light until after his death in 1895. And this isn’t even to mention all the other antecedents to Mendeleev’s table, which he published near-simultaneously in Russian and German. Lothar Meyer did include a preliminary version of his table in his 1864 textbook. Gustavus Hinrich, working in the US, presented a spiral periodic system in 1867, and Alexandre-Émile Béguyer de Chancourtois portrayed the periodicity of the elements on his ‘telluric screw’ in 1862. The ridicule that John Newlands had to endure for his ‘law of octaves’ in the early 1860s is well-known, and the British chemist William Odling also gave a pretty clear picture of the periodicity in an 1864 tabulation. Gordin’s point is not that it’s hard to say who discovered the periodic table first, but that, more profoundly, it is not clear what this notion of ‘firstness’ means. There are many ways to express the periodic system (just as there are to draw the table itself). And Gordin highlights that, for these 19th century scientists, both issues depended on what they wanted to do with their system. It was no coincidence that Lothar Meyer’s table appeared in a textbook, because he was more concerned with organising existing knowledge for pedagogy than with developing a predictive law. It has been a common claim that Mendeleev’s was the ‘bolder’ approach. But that doesn’t seem to reflect a difference of temperament, for the Siberian chemist was strongly conservative about pretty much everything else: the atomic hypothesis, the existence of atomic substructure, the reality of radioactive decay. In that sense he offers more of a cautionary than an inspiring tale: scientists who ‘discover’ a new ‘law’ are apt to be dismissive of anything that seems to threaten it. There may be an opportunity to learn a useful lesson here. As the case of Mendeleev and Meyer illustrates, priority disputes are nothing new (they were even more vitriolic in the Renaissance). But the reward structures that modern science has created – not just the Nobels and other awards but also (and often more lucratively) the patent system – have raised the stakes. That’s exemplified by the protracted and bitter argument over priority and patents on the CRISPR-Cas9 process of genome editing in the US, which have pitted Jennifer Doudna’s group at the University of California, Berkeley against that of Feng Zhang at the Broad Institute in Boston. The legal issues will always be (literally) a law to themselves, but such arguments risk creating a false impression of how science happens at all. It’s not that ‘firstness’ is hard to establish; it’s typically hard even to define. It’s unrealistic to expect that scientists will give up their ambitions of coming first. But it might make for a healthier research climate if everyone else were to respond: very nice work; now what are you going to do with it?